18 October 2016. An engineering lab designed a portable testing device connected to a smartphone that can analyze multiple specimen samples for a leading cancer biomarker. The team led engineering professor Lei Li at Washington State University in Pullman describes the system in the January 2017 issue of the journal Biosensors and Bioelectronics (paid subscription required). Li and colleagues are developing a simple system that can quickly and inexpensively analyze specimen samples from patients for biomarkers or indicators of disease, in this case the protein interleukin-6. This protein is associated with a number of disorders, such as inflammatory conditions, but high levels are also found in cancer patients, and associated with solid tumors including skin, lung, prostate, liver, and breast cancer. Clinicians screening individuals for cancer and many other diseases today need to send out specimens to remote labs for analysis. And while devices for testing samples with smartphones are being demonstrated, most of these systems can only test one specimen at a time. For a clinic or doctor’s office with any volume of traffic, these single-sample devices would be too slow. The device developed by the Washington State team adapts spectrometry to a standard Apple iPhone to analyze specimen samples. Spectrometry uses light waves sent through a substance to excite its molecules, with the beam directed toward a sensor. Before reaching the sensor, a grating diffracts or separates the light waves into colors, with a different array of colors providing a signature for each substance. The sensor then captures these signatures as data for processing, display, or storage. 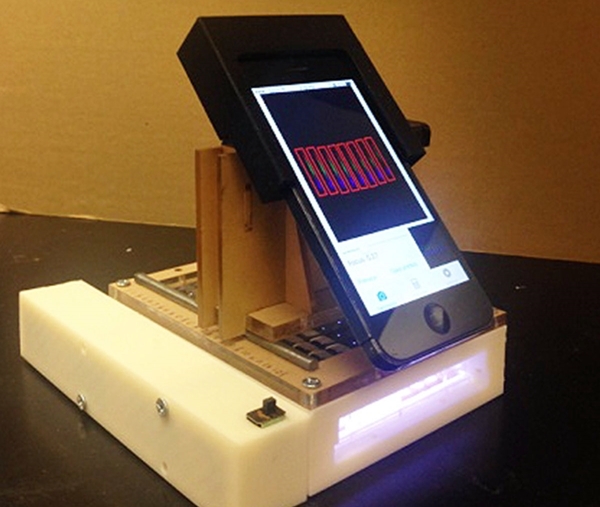 The Washington State device, called a multichannel smartphone spectrometer or MSS, is built on a cradle, 3-D printed in Li’s lab, that holds the light source. The light beams are sent through a frame with 8 channels, each channel holding 12 specimen samples, where a diffraction grate separates the beams into their signature colors. A sensor in the iPhone’s camera captures the diffracted beams, where a software app written for the device performs the analysis. The app performs a common diagnostic test called an enzyme-linked immunosorbent assay, or Elisa, that identifies antibodies in specimens, with color changes indicating biomarkers for disease. For the journal article, Li and colleagues conducted a proof-of-concept evaluation of a prototype MSS with lab samples already tested for interleukin-6. The authors report the MSS returned results conforming 99 percent with the standard Elisa lab analyses. The researchers are enhancing the prototype MSS to make it compatible with other smartphones and adaptable to real-world environments outside the lab. Li filed a provisional patent for his invention, which was financed in part by a fund at Washington State for start-up enterprises, which suggests commercialization plans for the device.